With our huge selection of tubular heater guards, you can rely on MS Guardio to supply the right guard to suit your needs. MS Guardio tubular heater guards are manufactured in the UK by AIANO, a specialist manufacturer of wire guards for health & safety. MS Guardio tube heater guards are available for all the leading tubular heaters including Thermotubes, Dimplex T range, Redring Suntubes, Creda SolTubes. MS Guardio tubular wire mesh heater guards include doubles, trebles and quads for banks of more than one heater. MS Guardio tubular heater guards come in a choice of two colours: cream (parchment), and white. Other makes of tubular heater guard are made to the universal principle – in other words, one guard to fit all models of tubular heater. Did you know that only AIANO, the wire guard specialist, manufactures two ranges of tubular heater guards to ensure that the guard you buy for your tube heater is exactly the right fit? Only MS Guardio today offers the full range of AIANO products online. Only MS Guardio today offers the full range of tubular heater guards to fit best both Dimplex and Thermo designs. AIANO tubular heater guards are recommended by Dimplex – the world’s largest electric heating appliances manufacturer. MS Guardio brings you the AIANO THG range of wire mesh tubular heater guards. If you are looking for a Thermotube guard look no further than the AIANO THG range, which was designed as a perfect fit for the Thermotube and similar sized tubular heater ranges. THG tubular heater guards are coated cream to match the Thermo parchment-coloured tube. Visit our THG page to browse the full range of THG tubular heater guards available from MS Guardio. MS Guardio brings you the AIANO STG range of tubular wire mesh heater guards. If you are looking for a Dimplex tubular heater guard look no further than the AIANO ST range, which was designed as a perfect fit for the Dimplex and similar sized tubular heater ranges, including tubular heaters made by Creda, Redring, Sunhouse.ST tubular heater guards are coated white to match the colour of the tube heater.Visit our ST page to browse the full range of THG tubular heater guards available from MS Guardio. The full range of tubular heater widths fo banks od 1, 2, 3 and 4 tubular heaters. The full range of tubular heater lengths from 1ft o 6ft. Why tubular heater guards? Why MS Guardio? Msguardio.com is the leading online retailer of AIANO wire mesh tubular heater guards, the leading tubular heater guard manufacturer. Tubular heater guards are often required in environments where there are young children or the elderly present. The guard prevents anything coming into contact with the hot surface of the tubular heater and causing injury or creating a fire hazard. AIANO manufactures the widest range of tubular heater guards on the market and only MS Guardio today offers the full range of AIANO products online. MS Guardio offers two ranges of tubular heater guards (THG and STG) to ensure the best fit with all the leading tube heaters on the market. The two tubular guard ranges are made to the same classic AIANO design, but vary in length to match the size of a specific tubular heater make. The THG range is recommended for Thermotube and Hylite heaters.The STG range is a perfect fit for Dimplex, Creda, Redring Suntube, Sunhouse and Heatstore heaters. THG12 is optimised for shorter tubular heater guard ranges including Thermotube and Hylite. STG12 – the guard is optimised for the longer length Dimplex, Suntube and Sunhouse tubular heaters. Here are just a few reasons why tubular heater guards from MS Guardio are the best on the market. MS Guardio offers two ranges of tubular heater guards (THG and STG) to ensure the best possible fit with all the leading tube heaters on the market. Tubular guards from MS Guardio are durable to help prevent damage caused to the heater, and finger-safe to reduce risk of injury caused by the heater. The AIANO tube guard from MS Guardio offers optimum heat circulation due to the open wire mesh design. MS Guardio tubular heater guards are suitable for covering heating pipes. MS Guardio stocks tubular heater guard for banks of two, three and four heaters (double guards, treble guards and quad guards), as well as the standard single tubular heater guard. The movable p-clips can be placed anywhere on the guard for flexible installation. Double, treble and quad guards for the THG range are available for order on the MS Guardio website today. Doubles, trebles and quads for the ST range are available by special order. 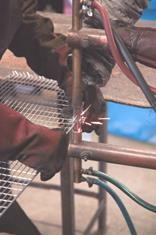 For bespoke tubular heater guards or pipe guards, please contact us with your requirements. We can supply guards with bespoke size or finish, such as brown or black coloured guards to better blend in a church, or galvanised guards for more exposed situations. If you are looking for Thermotube guards or guards for tubular heaters of a similar size, such as Hylite, MS Guardio recommends you select a THG tube heater guard. If you are looking for a Dimplex tube heater guard or a guard for tubular heaters of a similar size, such as Redring Suntube, Creda SolTube or Sunhouse tubular heater, MS Guardio recommends you select from our ST range of tube heater guards.